Step-up and into your POWER so that YOUR COMMUNITY will continue to grow in to the hearts of the world. 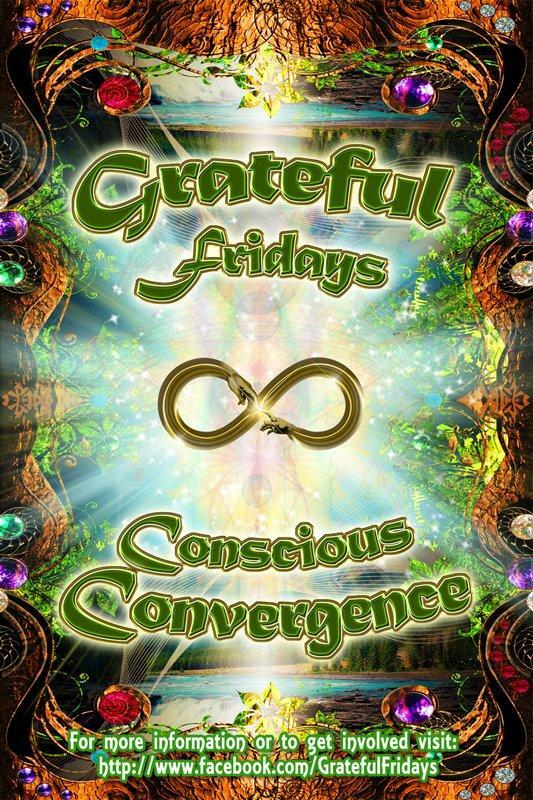 Be a part of Grateful Fridays Leadership activating our mission to *seed light* in and around the WORLD by activating your creative energy. Create a clearing for each other in a guided exercise to vent our challenges and move into a collective space of being Grateful. We Update on Various Grateful Happenings and Projects, Our Community and the World around us. Inspirational Short Film and/presentation from someone making a difference in the world now. Motivational Presentation on a conscious project just starting out. Our Charity for the Week and our Commitment to Inclusivity and Abundance for All!!! Much Love and Gratitude!!! Dr. Sarah Larsen is an Holistic MD, Nutritional Counselor, 3rd Generation Palm Reader and Prosperity Coach. She is an Internationally known speaker on Well Being, Immortality and Hand Analysis. Her approach has been described as merging ancient wisdom and modern medicine for optimal living! ★9:30-10:00PM Yoga: Jan's Hatha Flow Yoga will be facilitating a Hatha Flow Yoga session which incorporates Chaturanga Flow in between standing Hatha Yoga poses. The poses themselves will flow from standing to sitting to supine. We will end with a very relaxing Savasana. Namaste. Rawkstar Foods will be bringing the major yum with, Organic, Vegan chocolates, sweets and treats! Krishna Kitchen and Govindas will be providing Hot Indian Food! Rehmannia and the Shaman Shack will be there giving consultations and bags of goodness! Organic Chocolate Confections~Feather Hair Extensions and Adornments~Tarot Readings, Airbrushing Face & Body Painting, Light Saber Dancing, Live Art, Massage...and MORE!! By Healing ourselves... we heal the world.... we invite you to get a massage and/or healing by our highly trained and intuitive team of healers that will be on site. Half of your contribution will be donated directly to healing trauma worldwide!! By feeding ourselves with organic nourishing foods that contain the minerals, enzymes, and nutrients that sustain the function of our highly advanced bio-electric machinery of our bodies and minds, we achieve higher function and balance and a portion of the proceeds go to Charity. ~ "Realm of Raven" Originals. Brought to you by the Cafe Gratitude extended community. S&G Clothing by Sequoia & Gita, A.D. 2013, Veev Acai Spirit, O.N.E. Coconut Water, Kevita, High Country Kombucha, and Cell-Nique Organic Super Drink. DOORS: Come early for HAPPINESS Hour 7:30- 11:11PM Is a SUGGESTED CONTRIBUTION of $22 at the door. All levels of contribution welcome until 11:11PM after 11:11PM it will be $22 to enter. We are committed to inclusivity and abundance for all, we are a community supporting each individual of trade. Which means, if you are unable to provide a cash exchange to experience Hollywood convergence and emergence, we have ANOTHER way for you to be involved. Your contribution of time is a value to us! Please email gratefulfridays@gmail.com to offer your service inkind for a CERTIFICATE OF CARING. This CERTIFICATE OF CARING is valued as entry at any of our weekly events. *All Photographers Welcome! Ask us about content and ambassadorship programs.